Featured this month are Claudia Law, an internationally recognized art quilter, and ceramic artist Bonnie Morgan, who specializes in decorative and functional pottery. “Rodeo Flyer”, an eclectic country, rock & roll, blues band, will play on first Friday. Claudia Law is an internationally recognized art quilter and teacher, who has a seriously joyful relationship with fabric and nature. Claudia’s vision is to capture the beauty of nature and power of good design. 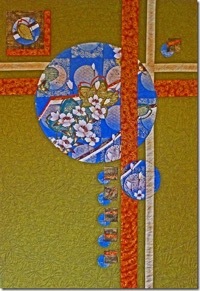 She revels in color and rejoices in texture, movement, luminosity, and the illusion of transparency – using paints, fibers, folded raw-edged fabric applique, beading, fabric confetti, thread sketching, free-motion quilting, and 3-D fabric motifs as needed – to bring life to each unique creation. Bonnie Morgan focuses on decorative and functional pottery. 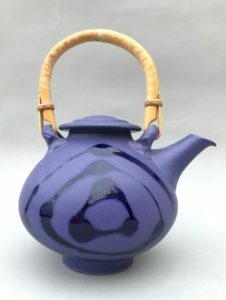 Currently she has been working on a series of teapots, covered jars, and serving platters. Porcelain and white stoneware and are her favorite clays to work with on the potter’s wheel and in hand building. Developing new glazes continues to be an interest and challenge that inspires excitement with each kiln opening.